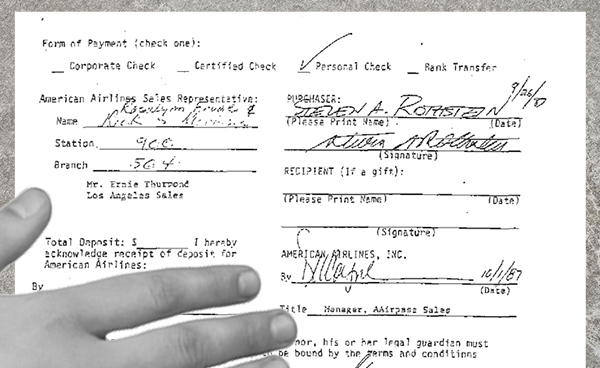 In the 1980s, American Airlines sold an unlimited, first-class ticket for life. But they didn't account for super-travelers like Jacques Vroom and Steve Rothstein. hree decades ago, 28 lucky bastards managed to snag the greatest travel deal in history, courtesy of American Airlines. It was dubbed the “unlimited AAirpass. For a one-time fee of $250k ($560k in 2018 dollars), this pass gave a buyer unlimited first-class travel for life. A companion pass could be purchased for an additional $150k, allowing the pass holder to bring along anyone for the ride. But the unlimited AAirpass had a fatal flaw: it was such a good deal that it ended up costing American Airlines millions of dollars per year — and the company set out to revoke the contracts of its top customers by any means necessary. American had been hit hard by the Airline Deregulation Act of 1978. They’d posted a $76m loss in 1980, and were grappling with new competition, reduced ticket prices, and a changing industry that threatened to sink them into irrelevancy. The airline’s newly-elected president, Robert Crandall, was on a mission to “cut American down to the bone” and lead a massive expansion from the ground up. American needed cash, but interest rates were at a record-high. So, they came up with a different plan: they’d raise capital from their own customer base by selling its wealthiest customers the “ultimate travel perk” — an unlimited first-class ticket for life. The cost: $250k. By 1994, American had discontinued the unlimited AAirpass — but not before 28 people got the deal of a lifetime. Steve Rothstein, then an investment banker in Chicago, was already one of American Airlines’ top fliers when he was approached to buy the AAirpass in the early ‘80s. 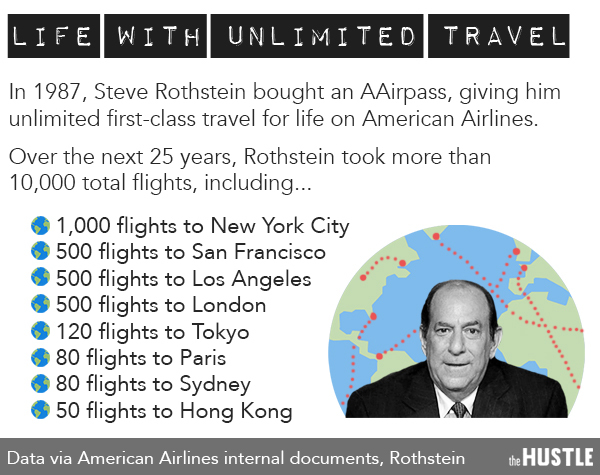 For a total of $383k, Rothstein purchased both the AAirpass and companion pass — and over the next 25 years, he proceeded to book more than 10k flights. He took hundreds of trips to NYC, LA, and SF. He went to London — sometimes a dozen times per month. He flew up to Ontario just for a sandwich. On occasion, he’d offer his companion pass to a complete stranger at the airport. Over in Texas, a direct marketing catalog consultant by the name of Jacques Vroom also decided to shell out the $400k for an AAirpass and companion pass. Over the next 2 decades, Vroom flew an average of 2m miles per year. He used his pass to catch all of his son’s football games on the East Coast. He popped over to France or London just to have lunch with a friend. When his daughter had a middle school project on South American culture, he took her to Buenos Aires to see a rodeo and flew back the next day. Decades later, in 2007, American once again found itself in financial straits. The company’s “revenue integrity team” found that AAirpass users cost the company big bucks — and they homed in on the program’s two most prolific users: Steve Rothstein and Jacques Vroom. American calculated that Rothstein and Vroom were each costing the airline $1m per year in taxes, fees, and lost ticket sales. It didn’t take long for the airline to find reasons to revoke the duo’s passes. According to documents unearthed by Los Angeles Times reporter Ken Bensinger, Rothstein had made 3k reservations in a span of 4 years and canceled 2.5k of them; Vroom booked flights for strangers and allegedly accepted payment for tickets on certain occasions. Neither of these practices was barred in the original contract. Nonetheless, American Airlines categorized them as “fraudulent activity,” and formed an elaborate operation to “take down” Rothstein and Vroom. In July of 2008, Vroom was cornered by agents at London’s Heathrow airport; several months later, Rothstein was stopped while boarding a flight at Chicago O’Hare. Both men were stripped of their passes and told they’d never fly on the airline again. 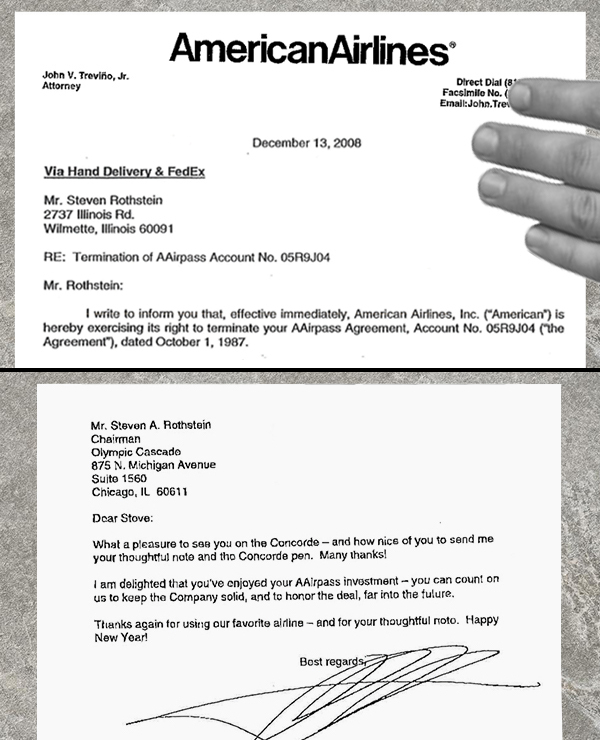 Rothstein and Vroom both filed lawsuits against American Airlines for the wrongful termination of their contracts — but were outmatched by the airline’s “bazillion lawyers.” Then, in 2011, American filed for Chapter 11 bankruptcy, catapulting them into an indefinite legal limbo. Neither Rothstein nor Vroom has recovered his AAirpass. A third customer also had his pass revoked; the other 25, including Mark Cuban’s, are still valid. Now a substitute teacher in Dallas, Vroom has a theory. “American was hurting, and went after the most vulnerable AAirpass holders to free up cash — people they knew couldn’t fight back,” he says. American Airlines declined to comment on this theory, or the program in general. For Rothstein is a bit more conclusive about the whole thing: “I wish I’d never bought the thing,” he says. 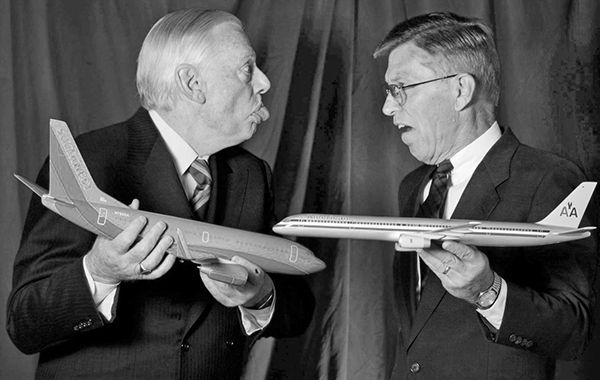 Looking back, the AAirpass saga was a fledgling in the airline industry’s race to the bottom. When the pass debuted in the ‘80s, we were entering a decade of decadence. Brands were competing for customers with amenities, luxuries, cushy promotions — hell, even hot meals. Now, we’re in the era of begging for peanuts and a few inches of legroom. Flying is just another commodity, stripped to the bare bones by a market struggling to reduce overhead. And in that market, there’s no room for men who fly to Paris just for lunch. Note: The original documents linked in this article are thanks to Ken Bensinger, who first investigated the AAirpass program in 2012. You can read his excellent story in the Los Angeles Times here.